Having always been enticed by sandy scapes, mazelike bazaars, and minarets and domes of mosques, I tried to convince my brand new husband; a staunch Francophile, to ditch the idea of a wintery Paris for our honeymoon, and opt for the unfamiliar but sunny, colour-soaked land of Marrakesh. Not a very tough feat, as Marrakesh’s beautiful Moorish architecture, scenic landscape, luxurious hotel properties and of course, its French influence sold him on the idea of taking this plunge into the unknown. From the minute we set foot onto Marrakesh ground, we were in awe – driving by the salmon pink painted town dotted with palm trees against the orange sun, we fell in love with our pulsating, ochre surroundings. After a ten-minute drive, we entered an oasis in the middle of the city, through a beautiful 2.5 ton arched, etched bronze door. Bankrolled by King Mohammed VI to contest the continuing surge of international luxury hotel chains in Marrakesh, our hotel The Royal Mansour was styled to pay tribute to Moroccan design. Exquisite mosaics, exotic birds in cages and detailed woodwork in the plush courtyard lobby welcomed us with our eyes wide, and our phone cameras out. The hotel is designed as a medina (city) where guests don’t live in rooms but in Riads that are set in a medina of its own within the eight-acre gated property. 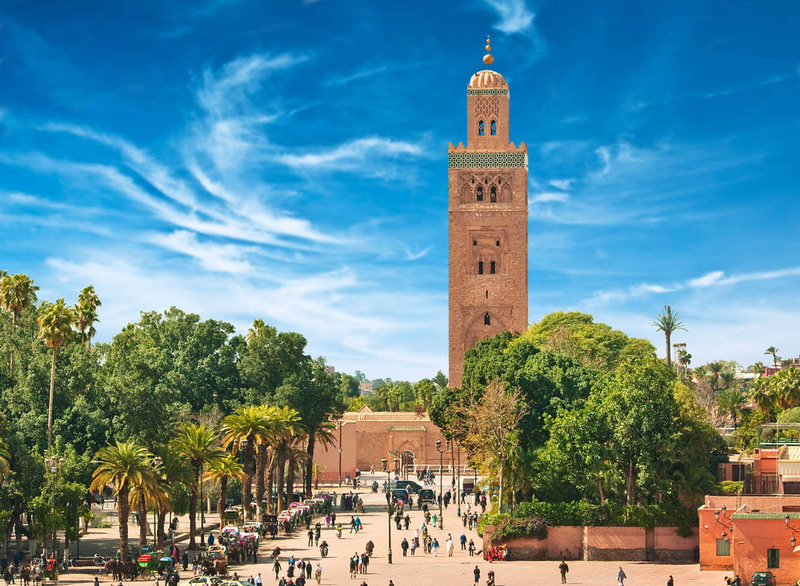 Morocco’s “Jewel of the South” Marrakesh is a confluence of cultures – Berber, Arab, Jewish and of course French, with the numerous French expatriates investing heavily in the upkeep and redevelopment of riads since the 60s. The country’s long history is also reflected in the architecture. While Morocco was not originally an Islamic country, the Islamic conversion of the Berber tribes influenced the building styles, making way for distinct architectural features such as mosques, the use of tiles in geometric patterns, fountains and gardens. There was also the Moorish influence such as horseshoe and clover-shaped arches, Spanish influence such as overlapping roof tiling and Andalusian gardens, one of the greatest inspirations for Moroccan public and private gardens. While taking a tour of our gorgeous three storeyed private riad, we were told how when Morocco was occupied by the French, the protector declared regulations for building standards, which directly affected the preexisting architecture such as the buildings could not be higher than four stories, planned areas had to dedicate a certain percentage for courtyards or gardens, and balconies could not overlook neighbouring residences. This emphasis on privacy is specific to Moroccan design – the lack of street-level windows and exteriors that are typically devoid of ornamentation symbolically represent a place of work, while interiors represent a place of refuge, also lending a feeling of intimate coziness and grace. Therefore, homes in Marrakesh may seem flat on the exterior, but these gems of traditional Morrocan homes in the form of Riads or Dars with beautiful courtyards and open skylights are hidden behind these ochre ramparts, creating a distinctive architectural sensibility that leave you wondering what lies behind the walls. Deciding to ditch the flashy wheels that gave us a ride to our hotel, and explore the ‘red city’ by foot, we first found ourselves at the main square Medina market. After stepping out of our tranquil sanctuary, into the myriad of crowded passages of the market in search of traditional Morrocan souvenirs and carpets, the medina that ranks among the world’s oldest and largest open-air markets, was echoing with buzzing scooters and constant come ons of hawkers and water sellers. Walking down the winding alleyways of the medina, we then proceeded to the ‘Le Jardin Secret’ or ‘The Secret Garden’ that was just as beautiful and romantic as it sounds. Slipping out of the hustle of the market into this quiet serene space, which is still right in the middle of the medina, makes you pinch yourself. Built from the ruins of a palace, the perfectly manicured garden with imported flora and unique old-world wrought iron benches is nothing short of paradise in the middle of Marrakesh. Our next stop was the Ben Youssef Madrasa, a star attraction for many. Madrasa, is a term for an Islamic college where students came to study the Koran. This particular Madrasa, at one time, one of the biggest theological colleges in North Africa, lies in the middle of the medina in the old part of the city, and was recently restored and rebuilt. 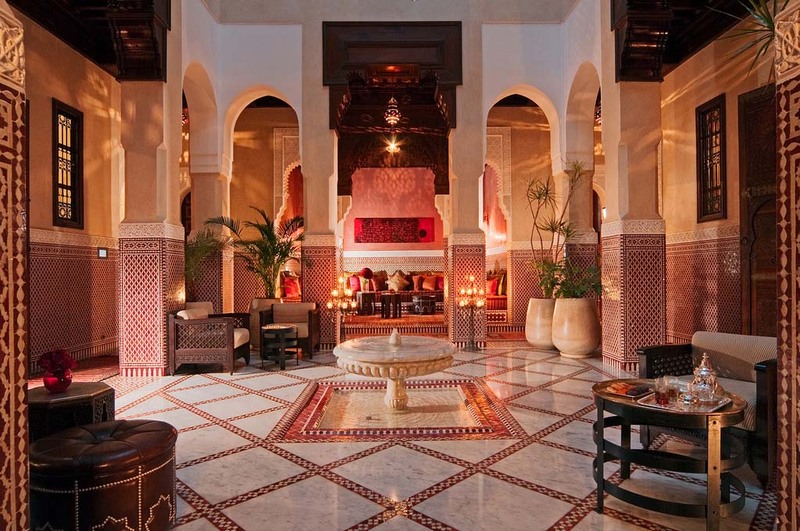 The large central courtyard is beautifully decorated in carved cedar and marble with lovely stuccowork, another distinctive Marrakeshi feature. 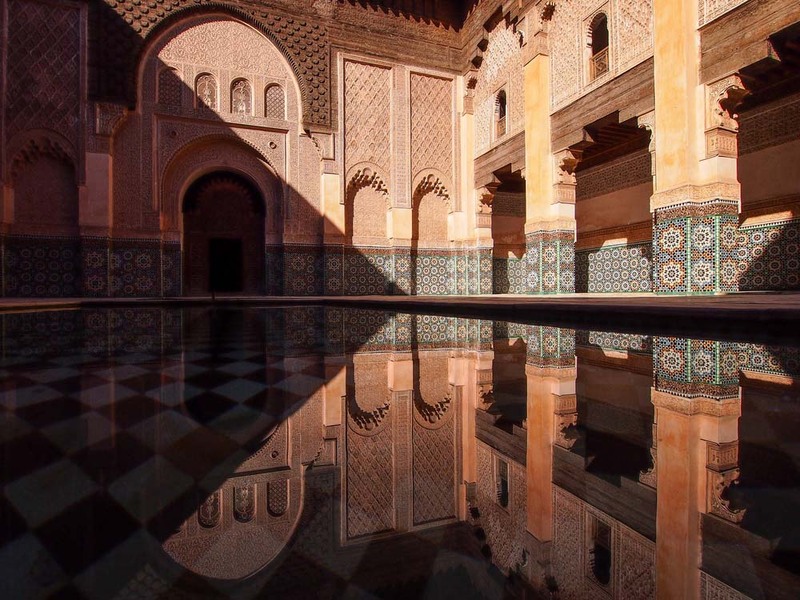 The tiles, laid out in geometrical patterns and bear inscriptions – mostly phrases from the Koran lay along the pool of water that served for ablutions and added a touch of calmness to the edifice. With so much inspiration around, it is no surprise that Marrakesh is emerging as a popular choice of destination for creative minds and the in-crowd; Kate Moss, Ralph Lauren, The Beckhams et all. A blogger’s paradise and celebrity hotspot, Marrakesh today has come full circle from its heyday back in the 60s when after its independence from France in 1956, Morocco and specifically Marrakech, took off as a “hippie mecca” for artists. A time when Hollywood starlets, filmmakers and fashion designers would be spotted enjoying Marrakesh’s kaleidoscope of colours, scents and sounds: think Andy Warhol, Rita Hayworth, Alfred Hitchcock, Martin Scorcese, Yves Saint Laurent and The Beatles. 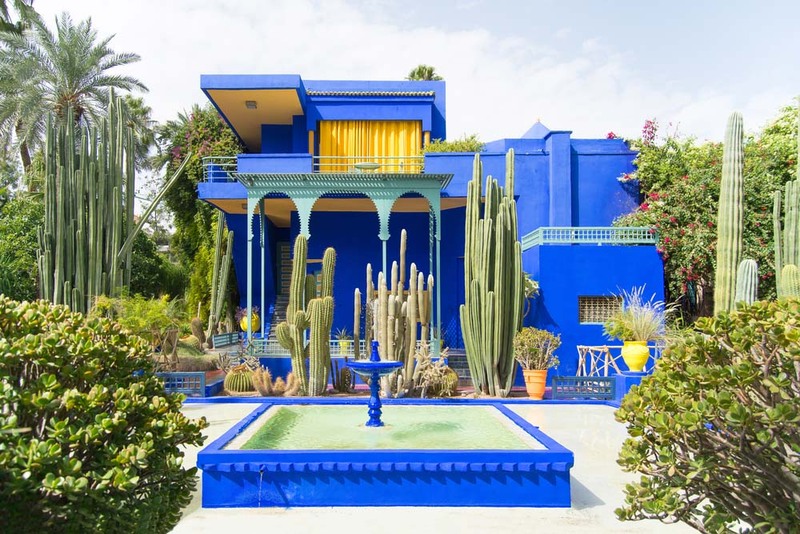 Through the courtesy of a very kind, newly-made American friend in Casablanca, we had the opportunity to visit the private museum/pavillion of Yves Saint Laurent and Pierre Bergé, the original home of Jacques Majorelle. Recently renovated, its small exhibition rooms have displays of Islamic artifacts and decorations including writing desks, a beautiful ornate fireplace, pottery, polychrome plates, jewellery, and antique doors. We then strolled in the lush tropical gardens full of cacti, palms and ferns and paid homage to Monsieur Yves Saint Laurent at his memorial in the very same vibrant blue garden where his ashes were scattered. An Islamic garden is meant to serve as a cool place for rest and reflection and a reminder of paradise. The gardens in Marrakesh with their sunny corners, prickly pears and fountains are as close to paradise as it gets. Whether it is donkeys idling in the ancient labyrinthine souks of the medina or Bentleys cruising along the streets of the chic Gueliz area that are lined with modish boutiques, Marrakesh is as trendy as it is traditional. Marrakesh is consistent with its juxtapositions – arid palmeraies with a view of the snow-capped Atlas Mountains, secret gardens in the bustle of maze-like medinas or beautiful riads and mosques behind walled embankments. 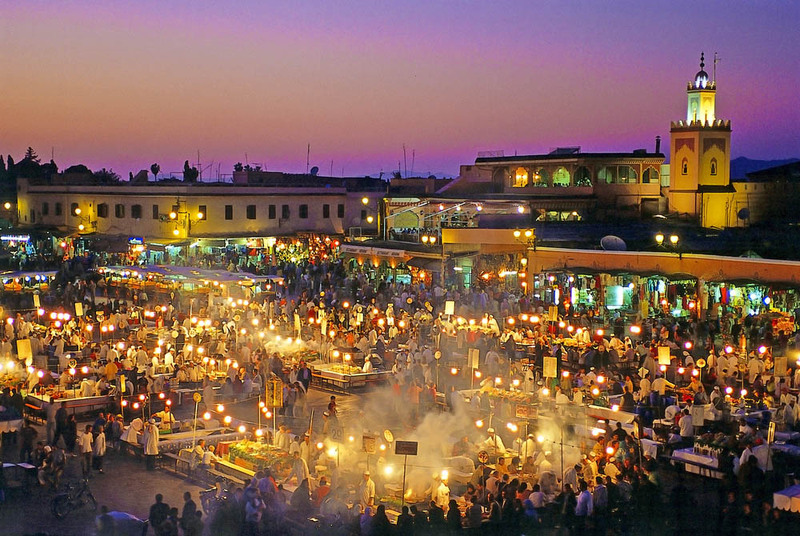 After spending days in the Marrakeshi sun and souks, we’d agree that Marrakesh, just like Paris, is always a good idea!